When I awoke early this morning I checked SILVER and GOLD PRICES and gold stood at $1,208 and silver at $16.48. Quite right. Say, conservatively, I was gratified. However, they came under attack about 1:15 this afternoon. The price of gold ended Comex at $1,201.50, $25.10 (2.1%) higher. Silver rose 20.8 cents (1.3%) to $16.148. The daily StockCharts chart I follow shows a lower high than $1,208, for some reason. That 200 day moving average stands at $1,207.93, so it’s not much wonder the GOLD PRICE didn’t blow past that on the first try. However, it ended above its 50 and 20 day moving averages, and within easy striking distance of the 200 DMA. Add to this an uptrend in force since the 5 June low. Assuming the price of gold finishes tomorrow above $1,200, next week ought to be hot for the GOLD PRICE. Behold, the chart on the right! The SILVER PRICE, it’s true, punched into its 50 and 20 DMA’s today, but in spite of its heroic rise to $16.48, finished the day only 1.3% better than it had started. I feel like somebody has shortchanged me, or the plastic gun I saved three weeks for broke the first time I played with it. 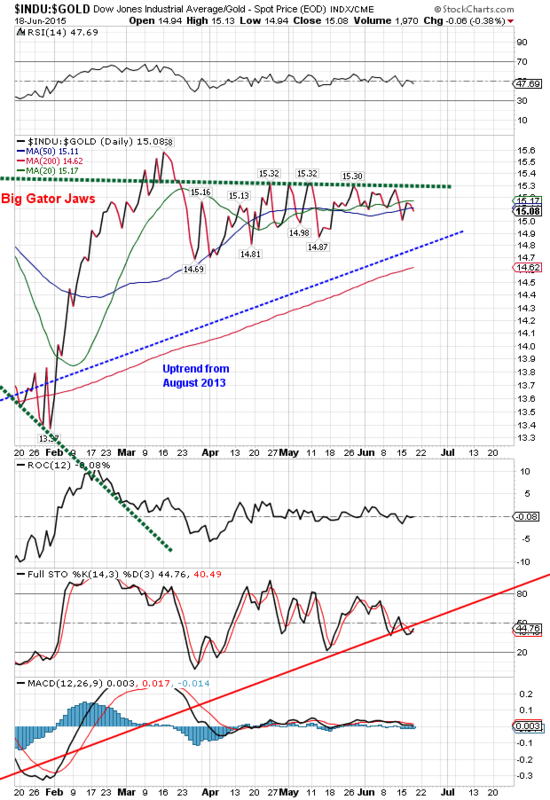 Still, momentum indicators have turned up, and silver’s 200 DMA stands only at $16.74. A 60 cent move is nothing for silver when it has its back up. Next week it should exploit today’s gain. I’m telling y’all, this is bottoming you are watching. This is the time you ought to be accumulating silver and gold. Low will come between now and mid-July. Besides, would you prefer to leave your money in the bank making 0.25%? I will be away at Lake Pickwick with my sons tomorrow, so I won’t be here to write a commentary. Accordingly, I’m closing out the week with Thursday. 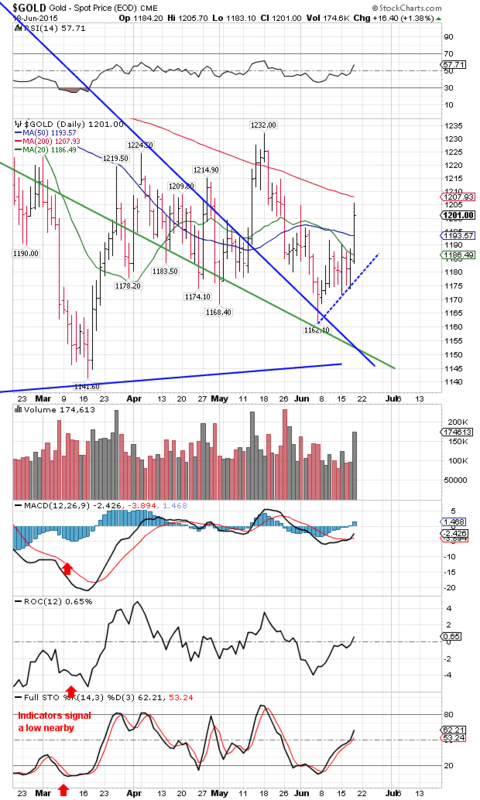 Trends are clear enough: stocks have perhaps begun their last little rally, US dollar index confirmed its intent to tunnel to the earth’s core, silver and gold prices are rallying. At one point today the US dollar index, leprous king among scrofulous fiat currencies, had dropped to 93.3, 119 basis points below yesterday’s close. However, it clawed its scrawny, repulsive self back up to 94.24, down only 25 basis points (0.26%) for the week. My o my, last week it closed 94.99, so for the week it’s down a clean and perfect 75 bps. Them fingerprints look like the heavy hand of the Nice Government Men, Mama. Euro finally is reaching for something. Closed $1.1368, up 0.29%, and nearer to the last high at $1.1469. Clearly the Fear of Greece hath left it. Maybe, but that goose ain’t cooked through just yet. ‘Bout the time you count a market out, it snaps back. Yen gapped up today and rose 0.38% to 81.34. Why, it’s above its 20 day moving average. Dow Industrials jumped 180.1 (1.00%) to an 18,115.84 close. S&P500 rose 20.8 (0.99%) to 2,124.24. Nasdaq Composite and Russell 2000 made new all time highs. Stocks may be making one last leg up, may even make a new all time high, but Lo, the end is certain, the time has come. 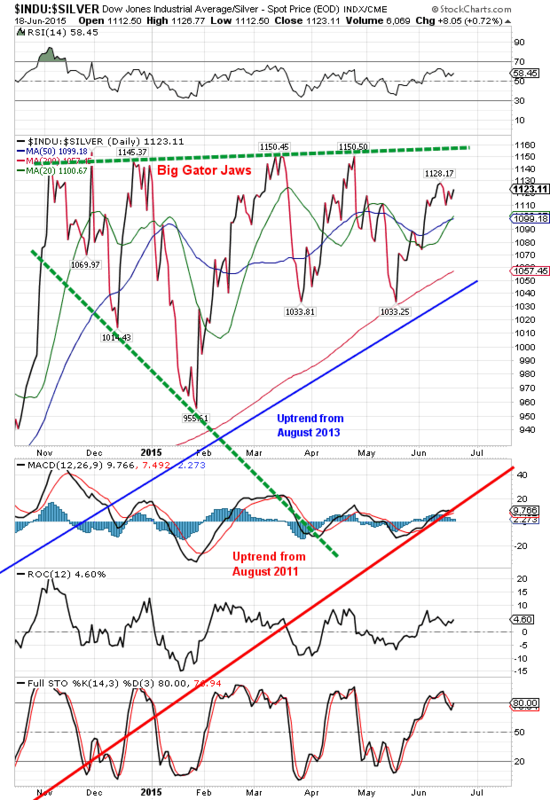 Dow in Silver remains above its moving averages, but has never reached the upper gator jaw on this latest rise. Ended at S$1,452.10 (1,123.11 troy ounces). Oh, when it cometh, that fall shall be great!